Table 'CUSTOMERS' might be out of synchronization. Rowcounts (actual: 135930, expected 135930). Checksum values (actual: 462894789443, expected: 461471150675). 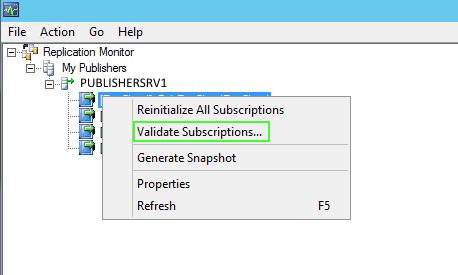 Here we have a situation where the Validation Subscriptions task output is showing the row count is accurate, but there is a difference in the record(s) values. To solve the record value difference(s) however takes a comparison of the table records column values themselves - for every record in the table. and then run a check on any Hashing differences which would indicate any difference exists in the column values itself. Step 1: Create a permanent table to hold the source table records hash value. Do this in Publisher & Subscriber DBs. Step 2: Create a Stored Procedure to hash all the table records. Do this in Publisher & Subscriber DBs. Step 3: Execute the above abstored procedure in Publisher & Subscriber DBs. This populates each TBL_HASH with the hashing record values. Step 5: Get the row number (ROWNO) & it's associated Primary Key. The row number is seen in SSMS in the query output / results tab. At this point you can look at those records manually and see the actual record value differences. Just query the Publisher & Subscriber DBs. Table 'CUSTOMER' passed rowcount (135930) and checksum validation. Checksum is not compared for any text or image columns. The Publisher & Subscriber table is now 100% synchronized. You can take the same approach for any table (article) you have configured for replication. in my case it was hashing a 500MB table in five seconds. The Geography data type does not work with HASHBYTES. You can filter out that column in the stored procedure syscolumns. Just know that those columns will then require a manual check if necessary.